if you click on the pictures, you can see them a bit larger! These are our first 4 peeps, obtained at 2 weeks of age from a local feed store. 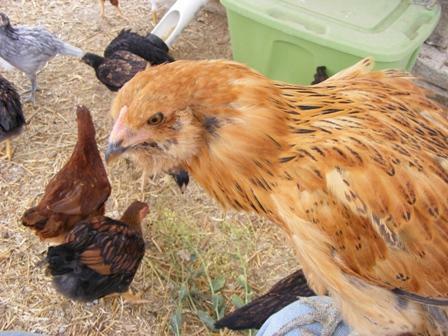 They were labeled "Ameraucana Pullets" and were very friendly and feisty. We brought them home April 19, 2010. My son insisted on sleeping with them so we put the incubator in his room. 1. black, gray & yellow, 1 (free rare breed?) possibly Andalusian, Jersey Giant, or some kind of Wyandotte? 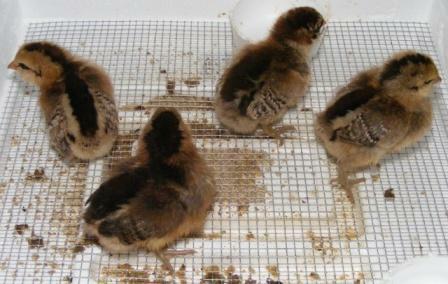 2. pale chipmunk colors, 3 possibly Sicilian Buttercup, Dark Cornish, or Speckled Sussex? 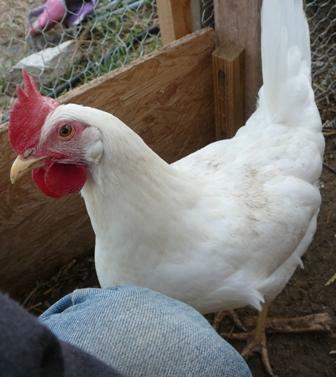 3. pale yellow & white, 6 (originally 11) possibly Delaware, White Leghorn, or Rhode Island White? 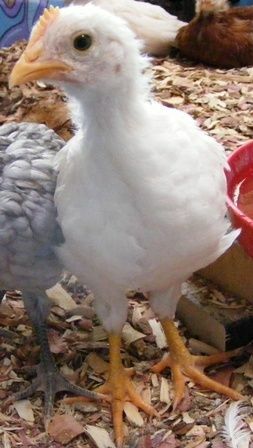 4. pale yellow & gray, 1 (free rare breed?) 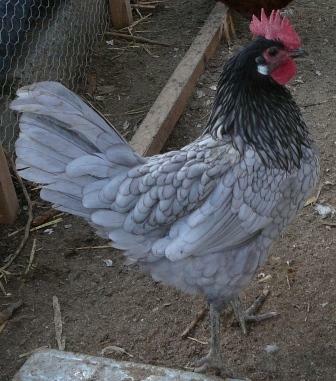 possibly Jersey Giant, Blue Orpington, Blue Andalusian, or some kind of Wyandotte? 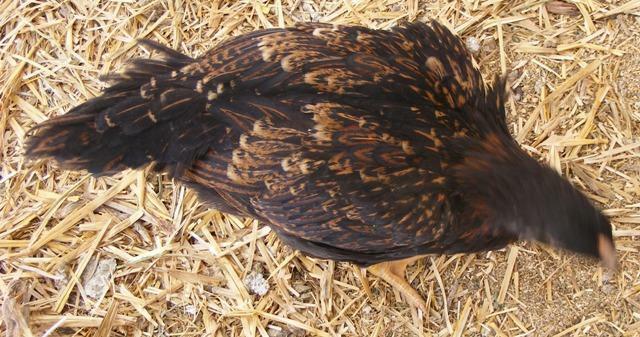 5. red, brown & yellow, 5 possibly Red Leghorn, Red Star, New Hampshire Red, or Speckled Sussex? There are also 11 "chipmunks", which look exactly like our first ameraucanas but we will have to wait and see what they become. i'm sure only half of them are ameraucanas. The others might be Cornish? Sussex? Buttercup? The family decided to pick up a few more chicks at the feed store "because 25 is not a good number, but 30 is" (don't ask). 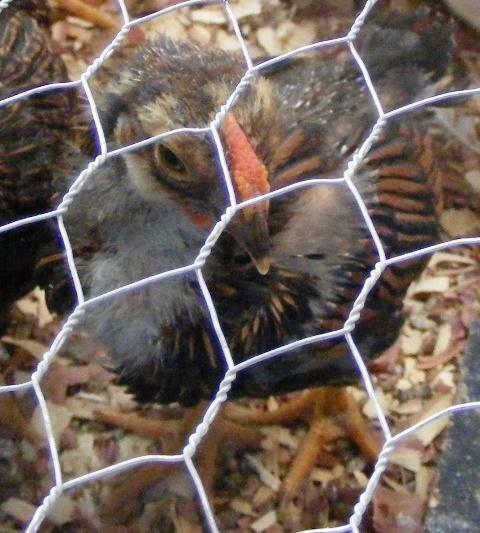 this time we came home with 3 silver laced wyandottes and 2 golden laced wyandottes. they are pretty camera shy so it's hard to get good photos. they also have a lot of feathers already. 2. i am pretty sure this is a Dark Cornish, although it might be a Barnvelder (there was a disagreement on the thread i was watching). 3a. i am pretty sure this is a Delaware. 3b. 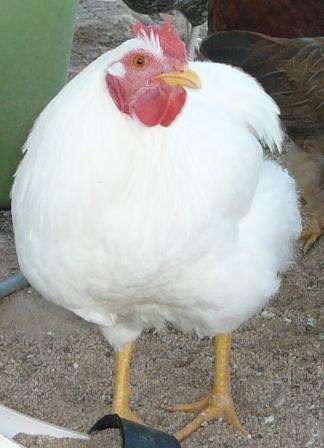 still confused - White Leghorn? Rhode Island White? maybe white Jersey Giant? 5. still confused here too. Red Star? Speckled Sussex? New Hampshire Red? any seem possible. thoughts on my breed guesses - they still have a long way to go before they have their final feathers, or i'd ask for suggestions. bummed about the roo, but was pretty sure the "extras" in my box would be males so it wasn't a surprise. also, having researched wyandottes, many owners say the roos are friendlier and quieter than some breeds so i'm glad he's one of them. most confused about the dark gray (blue?) 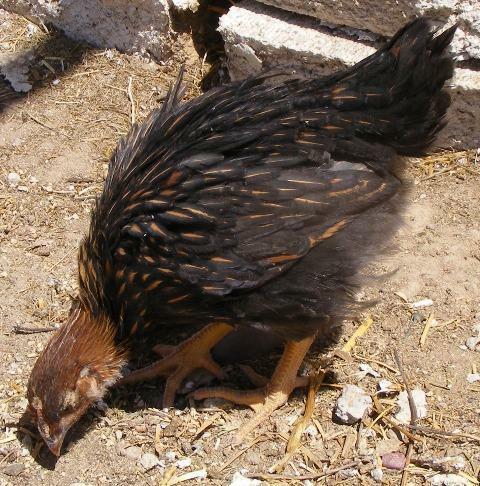 pullet. she is very pretty and i would like more of her next time. 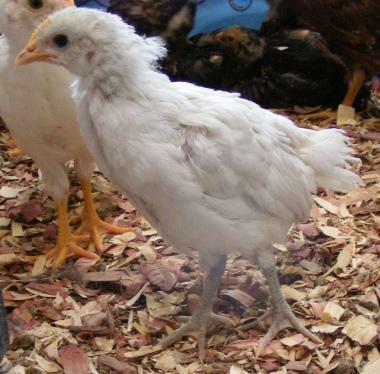 also the white with gray legs - she's the only one who survived from her group, and she seems to be actually pale gray or white with gray/black flecks on some feathers. very curious if the other white ones (with yellow legs) are roos or not. hoping not. joined a bunch of "breed threads" on the forum to hopefully figure out what i've got. here's a silver and a gold and some ee hawks! apparently no one wanted to come out of the coop into the sun where i could see them better. i guess pictures will have to be taken in the morning or evening from now on. also, these are all 2-4 weeks older than all the chicks that arrived together. hooray, we made it to 2 months! all 30 of us are still here and we look so grown up! 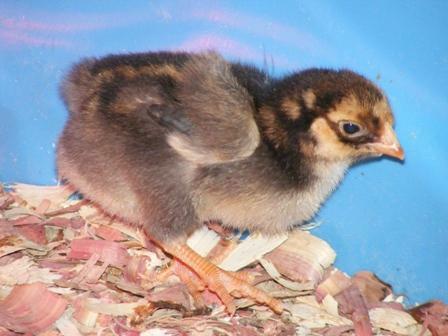 we now have learned that jersey giants are also giant as infants, so NONE of my chickies are that breed because all were the same size when i got them. 1. here's our young man, still taking forever to get his feathers in! a few are getting a very pretty green tinge. he has not started to crow but i did catch him clucking a few times. 2. dark cornish for certain finally. wow are they pretty! some feathers are penciled, some are laced, and some of the black feathers are actually green! they are not growing very fast though and are smaller than most of the others. and they have very fat legs, lol. 3a. our white and gray is now white with dalmation spots. her name is smudge. i posted a picture of her to see if anyone has ideas of what breed she might be but no answers yet. 3b. solid white chicks are still unknown. i posted a picture of her to see if anyone has ideas of what breed she might be but no answers yet. 4. still unknown. someone posted that the only blue they know for certain that mcmurray carries is the andalusian, but am waiting for other ideas as well. however i'm very impressed that the kid figured out that she would grow up to be blue, and so named her eragon (i think he meant saphira, the blue dragon, but only remembered the name of her boy). 5. still unknown. posted a picture in the sussex group to see if anyone recognizes her. 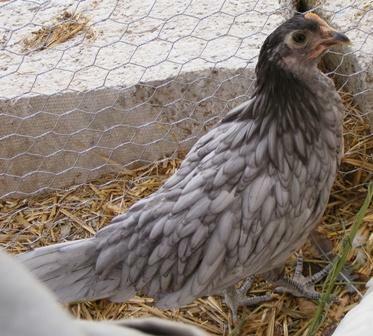 6. silver-laced wyandottes at about 3 months old (well one with her friends) and she sure is pretty! heard recently that they don't do well in heat though so i'm a little worried about them now. 7. gold-laced wyandottes also about 3 months old. one is quite a biter! they are starting to be lap sitters when we visit the coop. 8. 2 of the 6 ee's that all look alike, and the one that is our favorite named hawk who keeps trying to escape. mom and dad have been requesting updates on all their grandkids, and the end of summer and fall have been too stressful and busy to get any new pictures going. so finally now that we're past the harvest, it's time to add some new pictures. sorry for the wait, mom! first, all our babies who are now grown up! 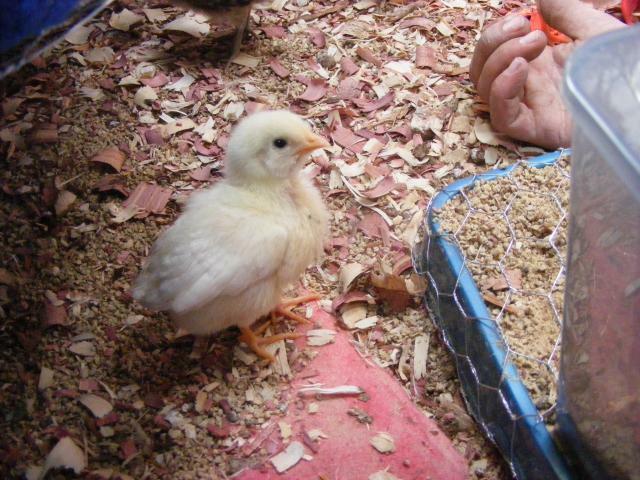 we got our first egg on september 11, 2010. it was a small light brown or tan one. yay, girls! after that it only took about a month before we were getting at least a dozen a day. the most we got was 23 in one day, which from 28 ladies was doing quite well i would say. 1. here is our handsome Gold-laced Wyandotte rooster, Avatar, who has turned out to be quite a gentleman and is not mean at all. although, he does try to crow in your ear when you come to "steal" eggs from his ladies. 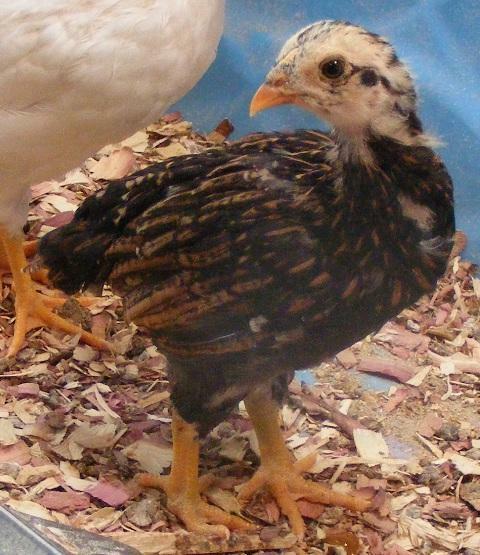 2. in front is a Double Laced Barnevelder, which took forever to find in the breed listings because they don't look like regular barnevelders at all, so you don't think to check the variations when you open the barnevelders page. 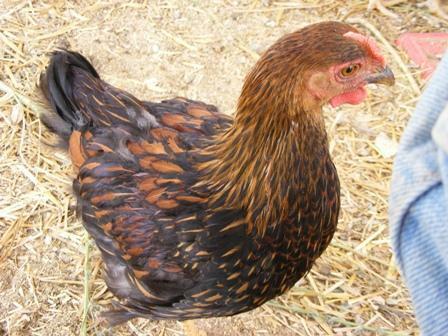 they are very friendly and lay a reddish-brown egg so we really like them because they are interesting. they must only lay once every few days however because we don't get very many of those eggs. they are all named "Pretty Girl" and we lost one to a predator so now we have only 4. in back is a New Hampshire Red, which looks like a Rhode Island Red except they are not as aggressive. 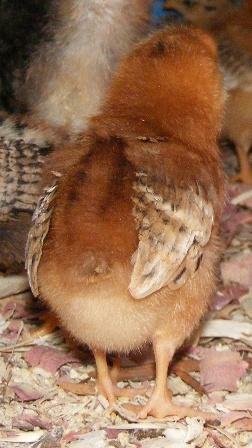 they are very nice girls and lay a light pinkish-brown egg almost every day. 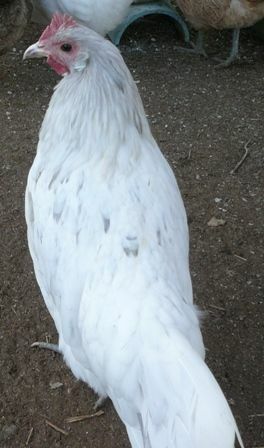 one likes to steal other chickens' eggs and set on them, and when you try to collect them she flares up her neck feathers and growls at you. we tell her she is a good mama and then she lets us take the eggs. they are all named "Red". 3a. Smudge is now grown up and has been identified as a splash-blue Andalusian. 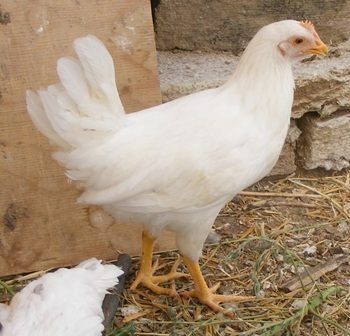 she lays cream-colored eggs and likes to fly up to your shoulder when you come into the run. 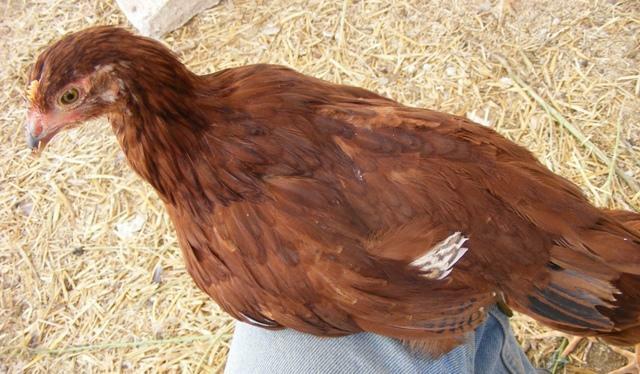 it took her forever to get her nice red comb and start laying eggs, several months longer than her sister. we really like this Andalusian breed but they don't survive well in the mail because they have a more delicate bone structure so most of them don't make it. they only lay every other day or so. 3b. these are all white leghorns, and although they aren't very pretty they are extremely friendly. one likes to gather up everyone else's eggs and keep them warm. these are our most regular layers, and we almost always get 3-4 large white eggs every day. they are all named "Mooney" and we lost one to a predator so now we have only 4. 4. here is Eragon, Smudge's sister, the blue Andalusian. she is very friendly but doesn't like to be picked up. she likes to peck at buttons and pull them off their threads. 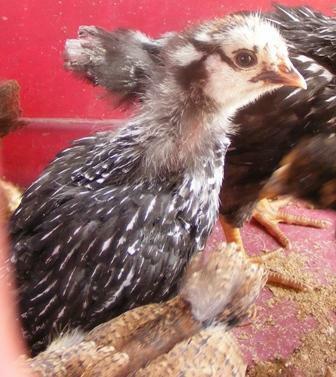 5. the Silver-Laced Wyandottes are named "Silver". 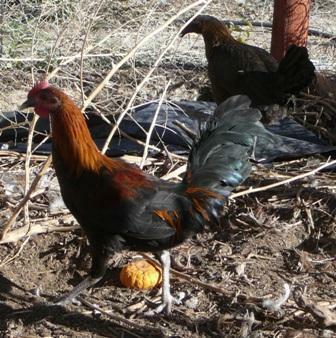 they are not very aggressive and get picked on by the new roosters. they sometimes make a purring sound when you collect their eggs, which are sort of an orange-tan color. they get very offended by any changes in their surroundings. 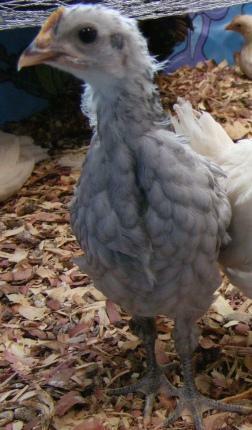 in this picture, she is angry about the arrival of new chickens to the group. 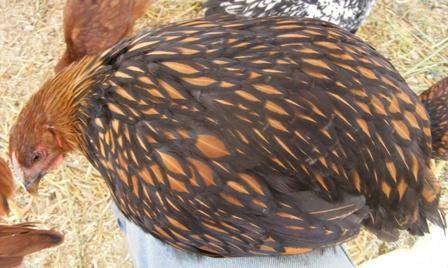 7. the Gold-Laced Wyandottes are named "Pecky" because one of them tries to peck when you get too close. she doesn't really mean it however and stops when you tell her no. they like to sit with you in the run and are pretty friendly. 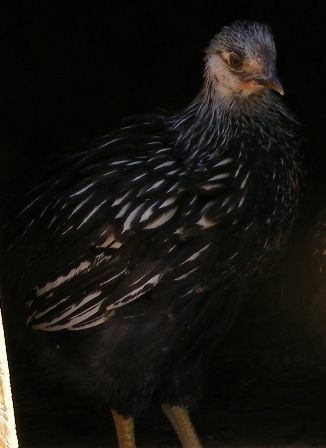 8. the Easter Eggers (Americaunas several generations out) are escape artists and have very strong personalities. they seem to be among the smartest of the breeds we have and sometimes try to hide their eggs or watch for a chance to get out the door. 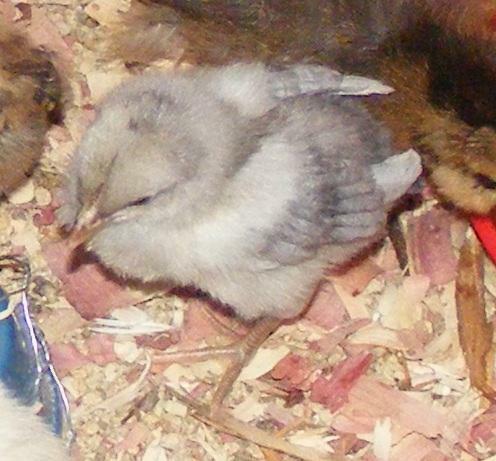 most of them lay pretty aqua colored eggs, but one lays brown because she has been crossed with too many other breeds since the blue egg gene, and one or two lay olive-green instead of blue-green. 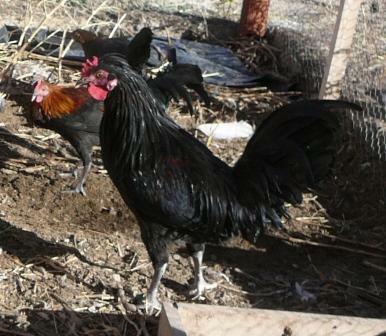 they get called "Houdini" when they escape, "Henny Penny" by their boy, and "Hawk". one day there was an auction which the farmer went to for some completely different object he was supposed to be helping someone with, and he saw some chickens for sale that were being treated not very nicely by their seller. being a bird man, he was very upset and vowed to rescue them from their certain fate as someone's dinner. so he called his wife, who was at work, and asked how much he should pay for grown chickens at an auction and she told him to make sure they were all hens, and not to go over $5 each. naturally he didn't listen and paid more than that because he got overly excited about the whole bidding process. the seller, a very shrewd business man, marked the farmer quickly as a person exhuberant about farming but without much underlying experience and told him there was only one rooster in the bunch. the farmer was annoyed to discover that after he had bought the chickens and brought them home, and sent cell-phone pictures to his wife (who was still at work), that quite a few of the hens were in fact roosters and refused to believe her assessment until several weeks later when the chickens finished filling out and crowing and it became obvious that the seller had yanked out the tail feathers of all the roosters, who had not yet fully developed their combs and wattles, so that he could pass them off as female to unsuspecting farmers who might be at the auction. at which point the farmer made grumpy faces at his wife because she had figured it out right away. it only took a few days for the chickens to all get used to each other. 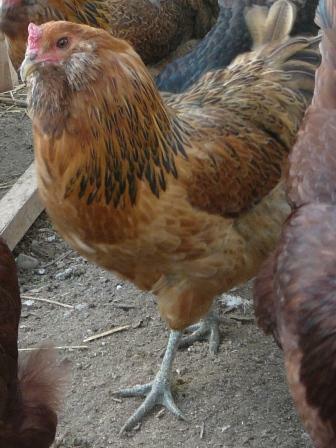 one hen is a New Hampshire Red, so now we have another of those. 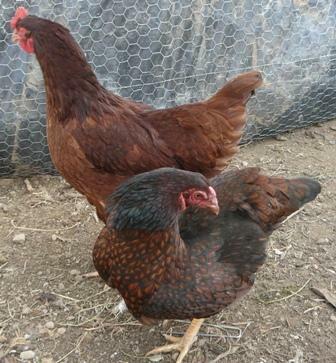 one hen (left side) is a Blue-Laced Red Wyandotte. 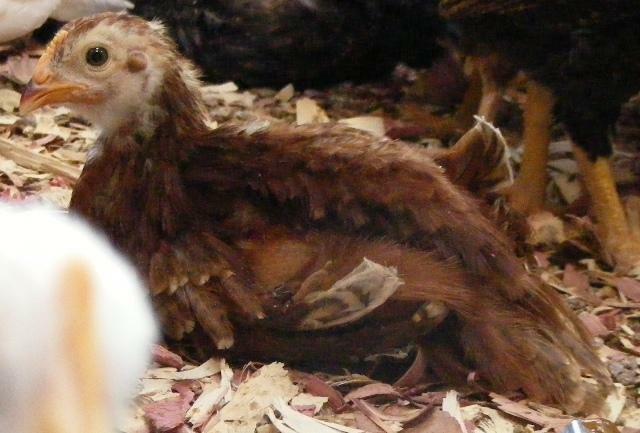 She is missing a lot of feathers due to poor handling but is looking better every day. she is afraid of people however and will not let us get close to her. her name is "Firebird". 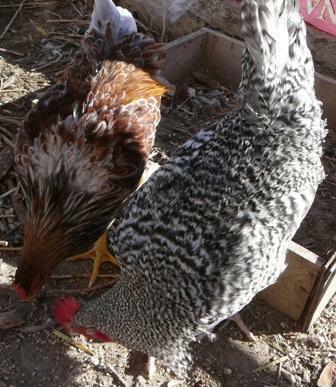 on the right is a Barred Rock rooster. we were really hoping he was a hen, but he's not. he appears to be fairly good natured, but we are going to have to eat him as the girls simply have too many males after them now. 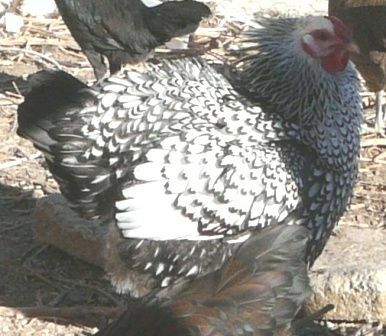 there are a bunch of game hens, i can't determine if they are "Old English Games" or "Modern Games" because there don't seem to really be specific characteristics, at least not listed on the breed pages, and they have a huge variety of coloring. 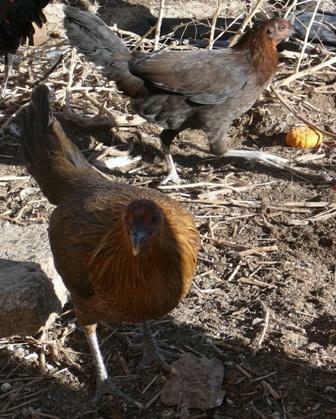 these are bantams with wonderful long legs and look like adorable little pheasants, and they make a strange sort of noise that isn't really a cluck. but they are very scared of people and won't let us touch them. 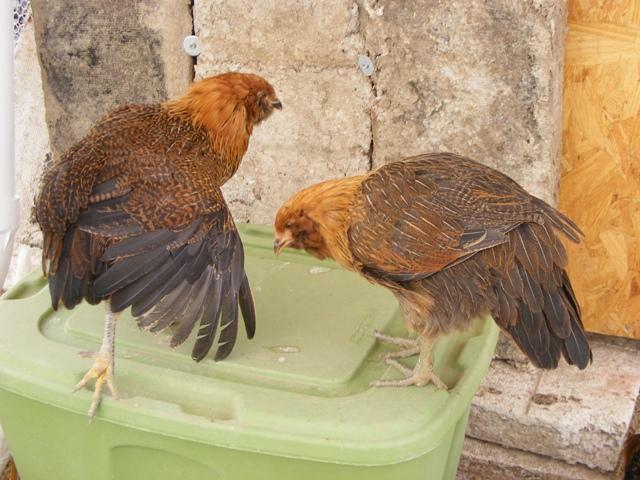 the game hens came with their own rooster, the only rooster the seller admitted to having, as it was obvious what he was. 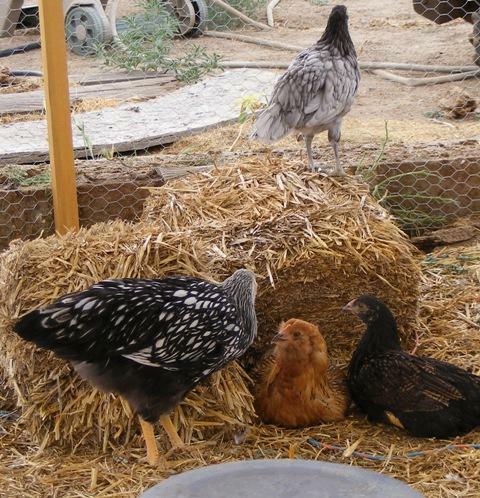 there is also a juvenile rooster with them. 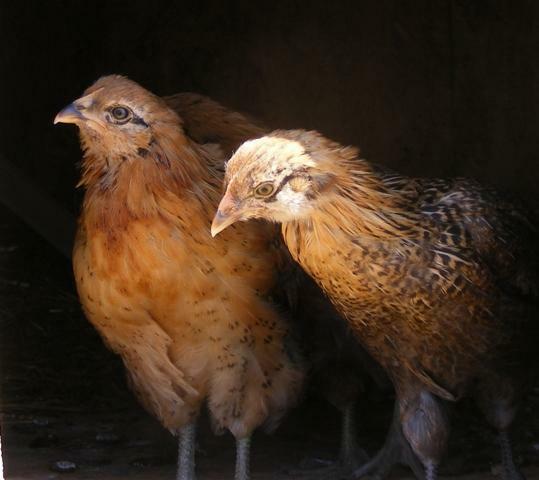 we named the grown rooster "Roobius" and the juvenile "Roobius Toobius" but we don't know if we will be able to tell them apart once they are grown. 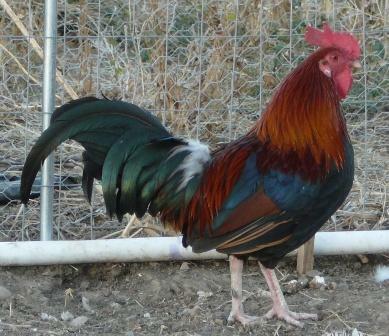 this is also a rooster. we don't know what to make of him. 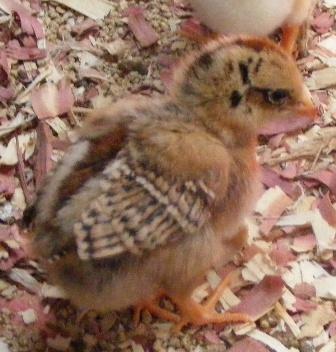 he appears to be a cross between a game bird of some kind, and a standard chicken. he has beautiful plumage which is black with purple and green iridescent colors in it. he probably won't stay here with us long, but he's not at the top of the list to eat either because first we have to get rid of the sumo twins. these are two Cornish Rocks. 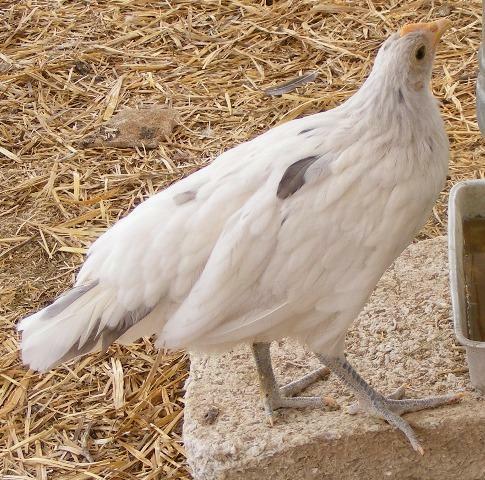 they are extremely aggressive roosters and very large, and are bred for eating, which is exactly what we will have to do with them quite soon because they are terrorizing all the chickens. Christmas 2010 Project - Click on the Incubation tab to see what we're up to now!